I love multi-functional holistic products, the ones that deliver more than you would expect, and do it really well. 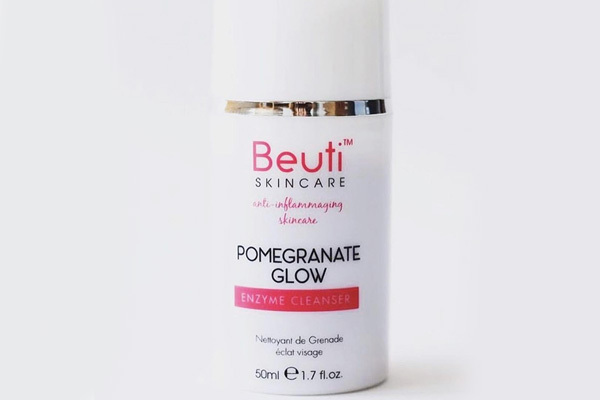 The latest addition to Beuti Skincare range is exactly that kind of product: The Pomegranate Glow Enzyme Cleanser. This multi-purpose product can tighten, smooth, exfoliate and moisturise your skin, giving it the well-deserved TLC it needs after a long day. The Pomegranate Cleanser is a gel balm hybrid containing a unique ingredient – fermented Pomegranate. This little miracle acts as a gentle glycolic acid to exfoliate and cleanse skin. The other two key elements to the product, Rose clay and Copaiba Balsam, cleanse and refine skin texture whilst soothing and protecting it against inflammation. The cleanser smells divine, every time I use it I feel like I’ve been transported to a luxury Spa somewhere in Thailand. And no wonder: the product features three flower essences – Iris, Laurel and Myrtle which are great to heal, sooth and keep skin youthful. Not only is it a perfect cleanser, it can also be used as a treatment mask: leave it on for 5-10 mins and let the enzymes and honey do the work, decongesting and refining the skin texture. The super-luxe bottle is packed with indulgent ingredients including Sweet Cherry, Almond Oil, Clay, Orange Peel, Honey, Mango Seed Oil and a very special Babassu Oil which is great for deep moisturise and a burst of Vitamin E.
The texture of the product is very dense, smooth and honey-like, so you may wish to use the special face cloth with this product. The result – you’ll feel like you have just come out of a luxury spa!